Do you like cream polishes? I do! I think they've taken a back seat lately to all the dazzling holos and glitters, but creams are really beautiful in their own right. Miss Ashleigh Show Me Your Watermelons is a coral leaning red, that is super vivid. 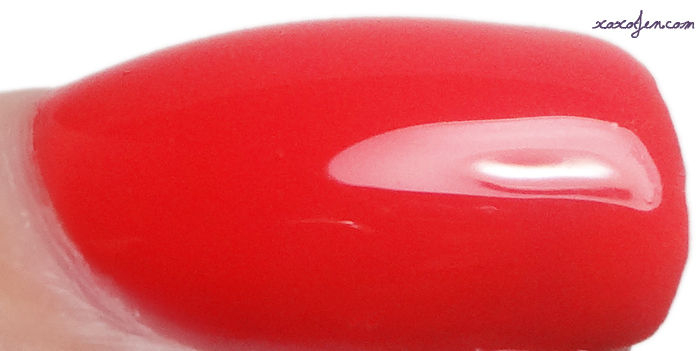 It has an impressively smooth and fluid formula, is opaque in two coats and super glossy on its own. I did use topcoat for my photos, however. Ella Ann Cosmetics or Miss Ashleigh's site are where to find this and many more beautiful polishes. This is a nice red! Definitely a fun summer look but also a good one for Christmas! Packs a little more of a punch than straight red.